I saw the latest James Bond movie, SKYFALL, this weekend and boy is it a doozy. After the disappointing QUANTUM OF SOLACE (stupid Writer’s Strike), the Bond producers wisely pulled out all the stops to make sure that SKYFALL was top-to-bottom brilliant. Oscar Winning Director Sam Mendes brings his usual confident, steady hand (not to mention cinematographer) to the proceedings and manages to do the impossible: make a 50 year-old movie series seem fresh and relevant. There are a lot of criticisms one can lob at a Bond movie, but for me the first thing that either pleases or disappoints is the theme song. The last two films in the long-running film franchise have had less-than-stellar songs…in fact, even though I’m a pretty big Bond fan, I had to go look up what the last two songs were in order to write this post. CASINO ROYALE, a fantastic reboot of the Bond series was shackled with the boring, unimaginative song “You Know My Name” by Soundgarden/Audioslave-mope Chris Cornell. Besides being overly-generic, the song had nothing to do with the movie. I know that these films usually have ridiculous, impossible to use-in-a-song titles…but “You Know My Name” wasn’t able to tie in any way to the film: weak-sauce. Speaking of ridiculous titles: QUANTUM OF SOLACE. As a Bond fan, I like to pretend that this film doesn’t even exist. This isn’t a film blog, so I’ll spare you all my armchair analysis, suffice to say during the middle of the movie I turned to my wife and whispered: “I am so bored right now. This is boring me.” There is nothing worse that can be said about a film than it’s boring. “Another Way To Die,” the film’s theme song isn’t boring in the least. In fact, a little boring might have been a good thing for the Alicia Keys/Jack White duet. The song is pairing of two really great artists who really do not go together well. The track is overstuffed and Jack’s fuzzy guitar, usually an asset, detracts from the proceedings because a Bond theme song is not supposed to be down and dirty or indie rock it’s supposed to be glamorous and high class. Ever since Paul McCartney & Wings excellent “Live and Let Die,” the Bond producers have chased that elusive dragon: a theme song that’s both good for the film AND a massive pop hit. As a result, a lot of really cheesy bands have contributed theme songs over the years that now seem a head-scratch worthy. How could we have grown as a culture had Lulu, Rita Coolidge, and Sheena Easton not been allowed the honor of performing Bond themes (?). If you are a little fuzzy on who Lulu or Rita Coolidge are, it’s okay: they’re musical footnotes. Sometimes flash-in-the-pan stars put out decent theme songs, like a-ha’s “The Living Daylights” for Timothy Dalton’s first outing as Bond (THE LIVING DAYLIGHTS). And let me go on record as saying that Duran Duran’s “A View To A Kill” is 1,000% better than the film A VIEW TO A KILL. But did we really need a Sheryl Crow or Garbage Bond theme? And do you even remember what songs they did? I didn’t. Which brings me to Adele’s song “Skyfall.” SKYFALL has so many good things that by the time it was over I had (nearly) forgotten how good the theme song was. “Skyfall” is a great example of how to do a Bond theme song right. Just grabbing any popular artist of the moment and having them turn in a song isn’t the way to go. Instead, a real singer was hired. Adele is an amazing singer. She’s also a very talented song writer! Taking a glance back at Bond themes of yesterday, I can’t help but notice that many were written by composer John Berry and not the act performing the song. 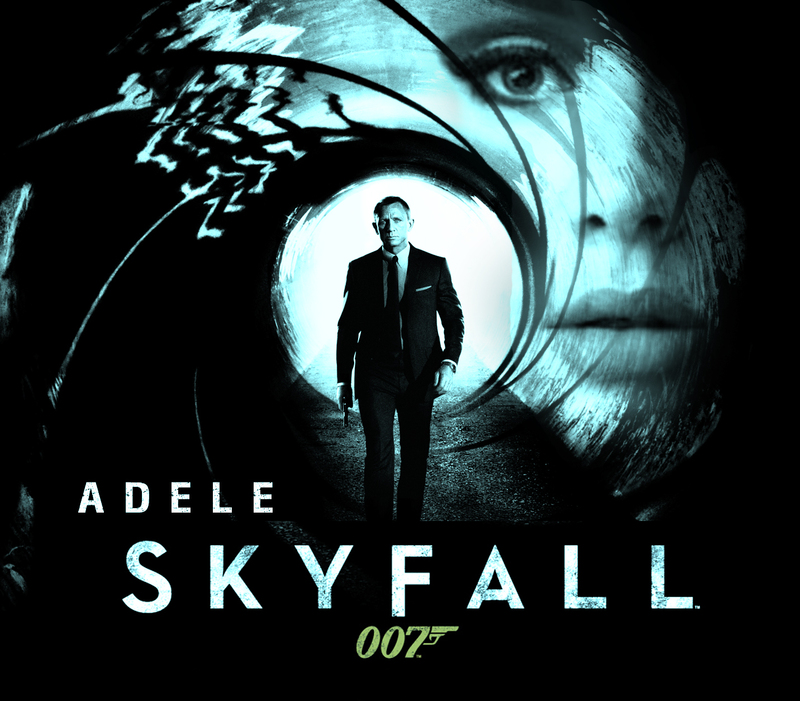 Adele’s “Skyfall” works not only because she’s such a good singer-songwriter, but because her style of music fits with the elegant, glamorous world of the Bond films. She’s a classy artist who’s song will sound just as classy tomorrow, or even ten years, as she sounds today. Maybe the song is a little old-fashioned, but I guarantee it’ll hold up infinitely better than a song like Gladys Knight’s “License To Kill” or Madonna’s “Die Another Day.” I’m not sure if “Skyfall” is going to be a smash #1 hit, but it’s a great song that isn’t boring to sit through AND just as important doesn’t embarrass the franchise. Which, let’s face it, has a lot to be embarrassed about (I’m looking at you Roger Moore). Oddly enough, all of this makes me think about Amy Winehouse. Winehouse was the #1 pick of both fans and the film’s producers to do a Bond theme. She was rumored to have been approached to perform the theme song for QUANTUM OF SOLACE, but it wasn’t to be. I remember when Adele first broke a few years ago, the first comparison made was to Amy Winehouse. The two are alike in many ways: both are women whose style is very much rooted in classic pop/jazz standards. Both wrote really personal, really good songs. Both were given amazing, powerful voices that don’t, on the surface seem to really fit their bodies. But whereas Adele is down to Earth and grounded, Winehouse was a complete and utter wreck. Winehouse and Adele actually remind me a lot of Bond and SKYFALL’s villain Raoul Silva. Silva is a former MI6 agent gone bad, he’s essentially an evil Mirror Universe version of Bond. I think that Adele is the white knight version of Amy Winehouse’s dark knight. I don’t mean to say that Adele is good and Amy Winehouse is bad, just that they’re different sides of the same coin. Adele is like the Winehouse who didn’t succumb to her fame: or Winehouse is Adele who did. After the movie I had trouble thinking about anything else besides this strange irony. Winehouse was never able to do a Bond theme, even though she seemed so well suited for it. Then SKYFALL comes out and there is Adele, doing a theme song that’s the best one in years. I feel like there should be a term for when art and life collide so perfectly.